The HP DesignJet Z5200 printer will shorten the initiative to obtain a value print. The inherent printer will have businesses wondering why they waited to take large-format printing in-house. People involved in bringing a printer capable of full-color print should consider this printer for a revolutionized way of doing business. 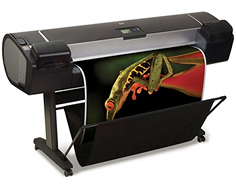 The automated large format printing process is similar to commercial class printers. Granted, there are fewer steps to take while completing a print with the automated large-format printing. The HP Instant Printing Pro will streamline the printing system with crop marks, orientation, preview, automatic nesting and document preparation. You can choose your desired color with minimal, unnecessary, trial-and-error printing processes. The printer features the capacity to calibrate and profile for superior color fidelity. The printing-rate saves five minutes on every print. Large-format printing can be added without slowing down the work flow. The time-consuming steps become reduced, if not, eliminated while you can manage your jobs effectively without losing the efficiency. Files can be submitted directly all at once with PostScript, in contrast to submitting individual files one at a time. The turnaround time for printing at production speeds will not harm the quality prints. The smaller the liters of ink that are used in prints, the better the color accuracy of print documents. 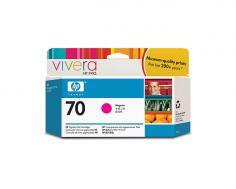 The standard ink colors will act as little as six picoliters and the specialized ink will spend four picoliters. The HP DesignJet Z5200 can print sharp nominal borders at 5 x 17 x 5 x 5 millimeters. The 160 Giga Byte of hard disk will reduce the likelihood of the printer freezing with the large buffer. The Excel Accounting Report will enable the manager see who, what, when and where someone used the printer. The Excel Accounting Report will be useful for businesses who use the printer for customer demands. When supplies are low, the printer will notify the owner, provide timely reordering with technology integrated in the HP supplies. The print-rate is accomplished at five minutes for the best quality, glossy document. For normal modes, it takes three minutes on an average. For coated documents, the draft mode takes the printer around 1-2 minutes. In normal mode for coated documents, it will take two minutes to print a page. Color line drawing will take one minute for coated draft prints. Plain papers will take a little less than a full minute to print. The HP DesignJet Z5200 utilizes the HP Thermal Inkjet for black & white or color. The Thermal Inkjet makes the color accuracy unsurpassed by conventional printers. The print resolution is astonishingly superior at 2400 x 1200 optimized dots per inch. The overall energy consumed while using the printer is unusually low at 170 watts maximum. While the printer's in powersave mode, it only uses 12 watts. The HP DesignJet Z5200 lives up to the stigma of being energy star qualified. For a printer that costs around $5,000, that is amusing. The printing languages diversity works well for various formats such as Hewlett-Packard-Graphics Language/2, Hewlett-Packard Printer Control Language 3 Graphical User Interface, G4, CALS, JPEG, TIFF, PDF and PostScript. The margin of print is minuscule at 5 x 5 x 5 x 5 millimeters. The printer weighs over 189 pounds, more than the average guy can lift. The spool located at the rear of the printer and will not go against the wall. If the printer's pushed against the wall, the printer has to be rolled forward to access the media changer. The noise-level makes itself obvious while running the computer. The sound pressure at 49 Decibels. The printer cost around $5,000, at this price, one would expect the printer to at least fax, and scan but the printer's sole purpose is to print. Review it: "HP DesignJet Z5200 "
The superior HP ink for the HP DesignJet Z5200 come in colors of photo black, matte black, light magenta, light gray, light cyan, yellow, magenta, and cyan. The cartridges come in sizes of 120 milliliters or 300 milliliters.